The world was a strange and startling place for Rip Van Winkle when he awoke from a twenty-year nap in New York’s Catskill Mountains. He had ventured to the woods to find a moment’s peace from “the labour of the farm and the clamour of his wife.” Now well rested, bountifully bearded, and slightly disoriented, Van Winkle returned to his village anxious to understand the changes that left him “alone in the world,” but pleased that he was now part of a “more fraternal, organic domestic order.” In the time since his fateful game of ninepins mixed with moonshine, Van Winkle, along with his male village compatriots, was now free to exercise his own masculine alternatives to traditionally female forms of domesticity. Maura D’Amore opens her book Suburban Plots: Men at Home in Nineteenth-Century American Print Culture with this unconventional reading of Washington Irving’s well-known tale. Seeking to understand the emergence of what she terms “male domesticity” in the nineteenth century—defined (somewhat inconsistently) as an ideology of “self-nurture in suburban environments [that provided] an antidote to the malaise of urban life and the strictures of feminine self-sacrifice”—D’Amore presents Rip Van Winkle as a prototype of various middle- and upper-class men who attempted to implement domesticity “on [their] own terms” in the midst of a quickly industrializing and alien world. The historical context for this argument will sound familiar to many readers. By the 1820s and 30s, the American northeast was quickly becoming a region marked by transformations in industry and transportation. These changes turned urban centers into booming metropolises and forced many Americans to rethink their relationship to their places of employment and their homes. Suburban, planned communities sprang up in close proximity to cities, while associated improvements in railways and steamboats enabled many people to shuttle between home and city in unprecedented ways. “The prospect of country life within city reach became increasingly alluring,” D’Amore writes, as city dwellers sought rural retreats to craft a new architecture and landscape of domesticity. As the traditional narrative goes, women were the key players in these new suburban spaces, as they cultivated nurturing homes for their husbands and sons making the arduous commute between city and country. Suburban Plots is particularly successful in the chapter “To Build, as Trees Grow, Season by Season,” which analyzes Henry Ward Beecher’s essay Eyes and Ears alongside his sisters Catharine Beecher and Harriett Beecher Stowe’s writings. Henry Ward Beecher advocated that young men look to the suburbs to implement creative solutions to the problems of industrialization. In an effort to help them reconcile their religious devotion to usefulness and stewardship with the pleasures of tasteful consumer culture, he stressed that men use their God-given imaginations “to beautify homely things.” When framed in this language, yard work, gardening, and family dinners could become “an acceptable substitute for . . . civic engagement.” In contrast, D’Amore stresses, the concept of female domesticity advanced by Beecher’s sisters maintained that women should channel their labor “through the rhetoric of selflessness.” Female domesticity was demure and altruistic, while male domesticity was “unapologetic” and “self-centered.” For Henry Beecher and his followers, men could sew, pick flowers, and cook fully secure in their masculinity because these interests provided “a testimony [to] yearning after things more fine than belongs [in the workplace].” This chapter presents D’Amore’s deepest attention to the interplay between male and female domesticity. Her argument excels when situating suburban landscapes as spaces where men could acquire new hobbies to counter industrialization’s stifling effects. Though fully intrigued by the argument overall, I finished the chapter wishing to know more about how these gendered interpretations of household life were in conversation and conflict as both men and women sought to improve the ambiance and setting of their homes in service of a larger civic purpose in the nineteenth century. Throughout Suburban Plots, it is clear that D’Amore is a skilled literary scholar. She reads her sources with a finesse that makes her chosen primary texts accessible to readers who may not be as familiar with the writings of Hawthorne, Beecher, Brisbane, and others. In the chapter entitled “Advancement and Association, Nostalgia and Exclusion,” in which she discusses the rise of Associationism as a radicalized form of suburban living, she reads Hawthorne’s The Blithedale Romance as a fictionalized, autobiographical retelling of his time spent with the Brook Farm community in the 1840s. While in the chapter, “’A Man’s Sense of Domesticity,’” she demonstrates how a growing popular magazine culture, which included Donald Grant Mitchell’s Rural Studies, catered to young men’s desires for bachelorhood and sources of creative expression. However, when D’Amore’s analysis turned to discussions of how these literary philosophies were implemented physically in the landscape, as an architectural historian, I begged for more. 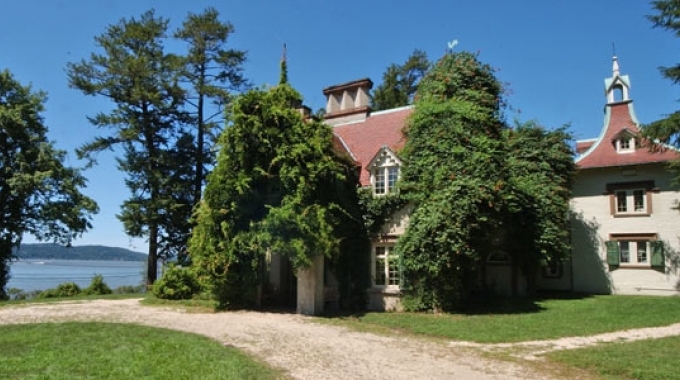 For instance, D’Amore’s presentation of Washington Irving’s Hudson Valley country home, Sunnyside, is one of the few examples of how men improved their homes in keeping with these masculine domestic ideologies. Irving’s 1836 renovations proudly displayed the popular architectural trappings of the picturesque style advanced by designers like A.J. Downing, while he outfitted the interior with indoor plumbing, cast-iron kitchen appliances, and an icebox. Here, Irving could revel in his bachelorhood whilst surrounded by the trappings of a male domestic environment that stressed natural surroundings, masculine artistry, and relaxed hospitality. But, as D’Amore notes, Sunnyside is an exceptional example of the ways men designed their homes in the nineteenth century. Not only was Irving a bachelor (he did not have to contend with the “clamouring” wife that sent his fictional Van Winkle to the Catskills), but his home was also the pinnacle of domestic achievement for suburban homebuilders. What about the domestic spaces for America’s more modest suburbanites? Greater attention to New York’s neighboring suburbs, like Brooklyn Heights or Staten Island’s New Brighton (which she addresses briefly) would have provided a much-needed comparison to the monumental projects of the region’s suburban elite. Washington Irving, The Sketchbook of Geoffrey Crayon, Gent. (1819-1820; repr., Charlottesville: University of Virginia Press, 2000) 69, quoted in Maura D’Amore, Suburban Plots: Men at Home in Nineteenth-Century American Print Culture (Amherst: University of Massachusetts Press, 2014), 10. Ibid., 3, 9. Finding a concise definition of “male domesticity” proved difficult. Other definitions could include Thoreau’s emphasis on “the space between city and wilderness as the ideal location for the home” (36), Beecher’s notion that men could “harness the power of [their] surroundings to affect mental states and communicate spirit . . . as a tonic for stresses . . . associated with their urban work lives” (39), or Hawthorne’s interpretation of suburban development as a “transformative process whereby radical reformist impulses are ideologically . . . packaged for middle-class consumption” (91). At the heart of these coexisting interpretations, though, is an understanding that domestic pursuits for men—whether designing a home, planting a garden, or cultivating spaces for community and socializing—were distinct from those offered to women. As an ideology, male domesticity provided a means through which men could come to terms with their ambivalent roles as commuters, heads of household, and creative beings. Henry Ward Beecher, Eyes and Ears (Boston: Ticknor and Fields, 1862), 218 quoted in Ibid., 49. Beecher, Eyes and Ears, 188, quoted in Ibid., 51. Associationism was form of community living advocated by Albert Brisbane in the mid-nineteenth century, modeled on the socialist philosophies of Charles Fourier. To her credit, D’Amore does engage with some of the foundational texts in the field of suburban and landscape studies including Kenneth T. Jackson’s Crabgrass Frontier: The Suburbanization of the United States (New York: Oxford University Press, 1985) and Dolores Hayden’s Building Suburbia: Green Fields and Urban Growth, 1820-2000 (New York: Pantheon Books, 2003). Alas, much of her analysis of these works is hidden away in the footnotes.